When you’re paying for a premium portable device, you want to make sure it’s protected against accidents. There are also a few additional features you might want, like better battery life or the ability to use your smartphone as your wallet How To Use Your Smartphone As Your Personal Wallet How To Use Your Smartphone As Your Personal Wallet The recent launch of Google Wallet is another indication of how practical and useful smartphone technology has become in just a few short years. Many people carry their phones with them everywhere they go. Based... Read More . That’s why there’s a huge range of cases for the iPhone 6 and 6 Plus, covering just about every usage scenario you can come up with. Still wondering whether or not you should get the bigger iPhone 6 Plus? We can help you answer that Should You Buy The Bigger iPhone 6 Plus? Should You Buy The Bigger iPhone 6 Plus? The term "phablet" very much applies to Apple's recently announced iPhone 6 Plus, but there's more to it than just a bigger screen. Read More . 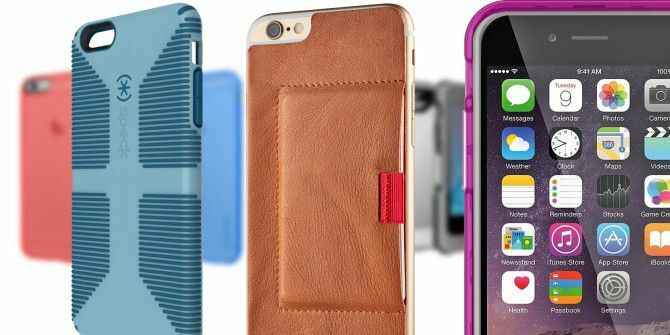 After testing over 70 different iPhone 6 cases, you can’t ignore The Wirecutter’s extensive review. If they say the Incipio NGP is a fantastic case for just $15, then it’s probably worth picking up if your budget is limited. The big reason for its success is that it protects your phone while still adding only 2mm to overall thickness, including a lip around the screen to lessen damage. As Wirecutter puts it, “At 9.4mm thick, an iPhone 6 inside an NGP is still thinner than a Samsung S5 or HTC One M8 at their thickest points.” Sold. While Incipio’s NGP is all about making your iPhone feel like the premium device it is, Speck’s CandyShell straddles the line between rugged and sleek. As the name suggests, it has a hard shell exterior, but the insides are lined with soft rubber and reinforced corners. More importantly, this is among the few cases that supports military-grade drop tests, and a raised bezel that protects the screen. Plus, for those moments when you want your iPhone to feel like your iPhone, it’s easy to slip the CandyShell off and on. If you want the CandyShell for the iPhone 6 Plus, you’re better off going for the CandyShell Grip, which offers raised rubber ridges along the back for a better grip. 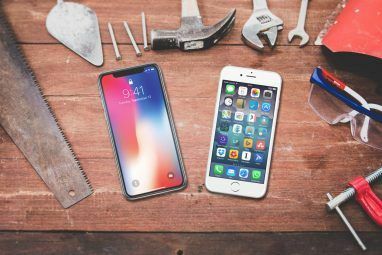 The phablet can be difficult to hold with one hand, as noted in our iPhone 6 Plus Review iPhone 6 Plus Review and Giveaway iPhone 6 Plus Review and Giveaway The 5.5-inch iPhone 6 Plus is Apple's latest and perhaps strangest addition to its range of tablets and smartphones. Read More . On the bigger iPhone 6 Plus, there really is no need for a battery case as the device itself has a mammoth battery but on the smaller iPhone 6, you might need more juice. If you bought a battery case for your iPhone 5 The Best iPhone 5 Battery Cases Compared The Best iPhone 5 Battery Cases Compared The small, thin iPhone 5 only has so much room, and a small battery almost always leads to modest talk time. Buying a battery case is the easy solution. But which should you buy? There... Read More , you have two decent options at present if you’re upgrading to an iPhone 6. The Alpatronix BX140 is a slim cover but still packs a 3100mAh battery, compared to the 1810mAh battery of the iPhone 6. That’s a 150% boost in battery life. It’s a simple rubber and plastic case, with openings for all ports, and it’s relatively cheap on the right side of $50. If you can spend some more, the ArmorPro case is compelling. Apart from a 3500mAh battery, it also has a durable, robust exterior which looks like it can take a few bumps while admittedly adding a lot of heft to the iPhone. Griffin has always made some of the toughest iPhone cases money can buy The 5 Toughest iPhone Cases Money Can Buy The 5 Toughest iPhone Cases Money Can Buy Apple’s latest iPhone is surprisingly robust given its light weight but it’s only designed to survive minor drops in a friendly environment. Serious falls, dirt and water aren’t a factor, and that’s a problem if... Read More and things are no different with the iPhone 6 and 6 Plus. The Griffin Survivor All-Terrain has a foam-lined polycarbonate frame for the body and a built-in screen protector that still feels just like your iPhone screen. All buttons and ports are sealed, but the ports can be opened when needed. Wind, rain, dust — the Survivor laughs it all off, even while taking a drop from 6 meters high. Just in case it’s too big for your pockets, Griffin throws in a belt clip too. 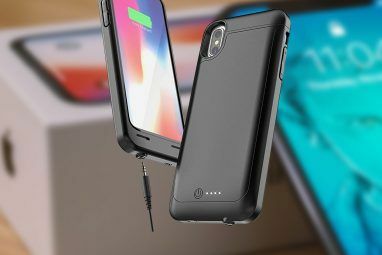 The Otterbox Defender is close competition to the Griffin Survivor, but several users have noted that the Defender’s gap between the screen and the protector makes it not as pleasant to use. Fellow MakeUseOf writer Bakari Chavanu swears by his Wally stick-on wallet for the iPhone, and DistilUnion has created two variants for the iPhone 6 and 6 Plus, which are now available for pre-order. The estimated shipping date is December 1. The Wally holds up to 4 cards, and sticks on the back of your iPhone with adhesive made by 3M, the makers of the Post-It Note. It’s crafted from a single piece of genuine leather and contains no magnets. The best part? Wally can even stick on top of some cases, so you don’t really have to choose between a case or a wallet – you can have both! This is a small collection of recommendations for the many, many cases available for the iPhone 6 and the iPhone 6 Plus – and we want to know what you think. 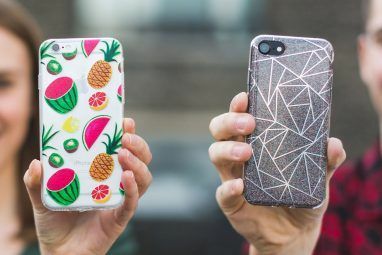 Which case have you got on your iPhone 6? Explore more about: iPhone 6, iPhone 6 Plus, iPhone Case. I like my good old Otter Box defender case. I had one on my iPhone 5 and it was a lot better than the more expensive one I got with my phone, that was supposed to be indestructible. Spigen is one of the top brands for casing they have the best selection for any mobile phone, compared to Speck which has the worst design, i thing you should included. What Are the Best Cases for the Samsung Galaxy S8?